The instrument has an elaborate and decorated nocturnal on one side, and a Regiomontanus-type dial on the other. The nocturnal is engraved with figures corresponding to the zodiac signs, and the pierced lunar volvelle shows not only the phases of the moon but also the corresponding phases of life. The instrument is also extensively inscribed with instructions on its use. 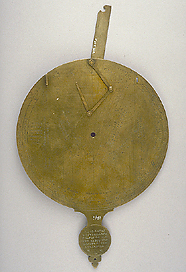 A similar instrument is in the Museum of History of Science in Oxford (Epact 97152).